We don’t really frequent chain restaurants on a regular basis, we tend to gravitate more towards locally owned establishments with seasonal menus. This way of dining certainly limits our choices; however, we typically find ourselves pleasantly content with all aspects of the local dining experience – fresh food that’s in season, and most of the time they can even tell us where the produce came from that day. Not so with most chain restaurants. Most of the time we walk away from a chain feeling as though we’ve been a little ripped off. We’ve had far too many less than adequate experiences with the chain scene and at some point found ourselves questioning why we continued to dine in a restaurant when we weren’t happy with the experience. This certainly caused us to branch out a bit within our area – which was awesome, because we now have a pretty fantastic repertoire of restaurants on our radar that includes some of the best food that either of us have tasted. However, we still crave certain items from some of the chain restaurants we used to frequent. 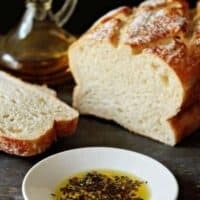 I’ve been seriously jonesing for some Carrabba’s Italian Butter and thought this would be the perfect opportunity to post the recipe on MBA. If you have never dined at Carrabba’s, you may not have experienced the herb and olive oil bliss that they serve with every meal. It’s incredibly addictive and pretty much the number one reason we used to dine there. They bring it out on a small dish and add olive oil to it table side – creating the perfect “dip” for their piping hot bread. Although I was aware that olive oil came in several varieties, I wasn’t aware that you can actually conduct an olive oil tasting. Pretty fancy, huh? An olive oil tasting is actually performed much like a wine, coffee, or bourbon tasting following the “Four S’s” (Swirl, Sniff, Slurp and Swallow). After several sniffs and slurps, we decided to conduct our little tasting with pieces of ciabatta and we were surprised how much the oils varied! I’m not going to pretend that many a meal I wouldn’t be content to simply sit with the bread, the Italian butter, and a glass of vino- who needs an actual meal? A copycat of Carrabba's Italian Butter made with a blend of herbs, garlic, and olive oil. In a small bowl, mix together the dry spices. Add crushed garlic, stirring to combine and moisten the herbs. Transfer herb mixture to a small dish or bowl. Pour olive oil over herb mixture. Feel free to use fresh or dried herbs. For the recipe above, I used all dry herbs with the exception of the rosemary. Thank you for posting this recipe. My husband loves Carrabba’s olive oil dip. It is indeed, addictive. Are the measurements in your recipe based on dried herbs or fresh? (I was thinking that I read somewhere that you use less (more?) if you are using dried.) Thanks. I used all dry in this recipe except for the rosemary. Thanks for stopping by. 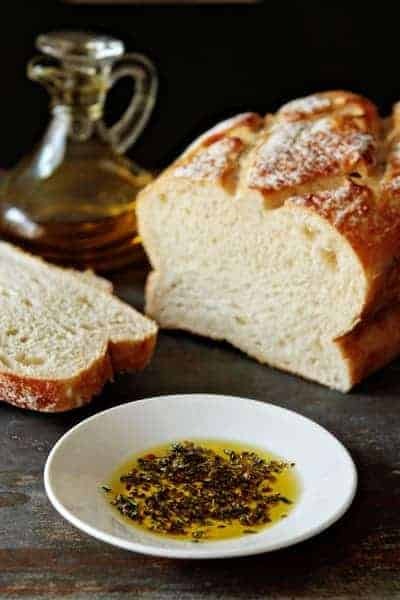 This looks amazing… I’m tempted to go preheat the oven to bake some bread just so I have something to dip and a good reason to make this oil!! 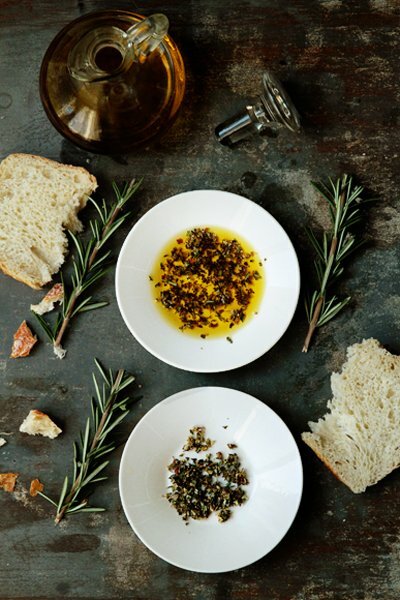 Ahhh… the simple pleasure of bread and olive oil and some herbs. It’s a favorite of mine. Thank you SO much for the recipe…I LOVE that dipping sauce…it’s incredible! We’re just now getting ready to harvest our olives…in the ‘panhandle’ of the boot-shaped peninsula…..your recipe is excellent. As is Carapelli(an Italian producer which has various gradations of oils). Have you ever tried dried lemon peel, origano and garlic in oil. Let sit for a few hours and use on fish? I would also recomend a simple olive oil, 2 drops of water(helps emulsion of same) and lemon juice for artichokes. Am so glad to see that folks in the USA are into olive oil….it’s really good for you and helps good cholesterol! I love this! At my old home, I had Rosemary growing in the front flower bed. I could just pick ht I need, add it to bit of garlic and red pepper, and serve with olive oil and home made bread. Lovely! This looks delicious and your photos are just stunning! this is great! I always wanted a good dipping sauce for my breads and this is it! I know the feeling of always feeling underwhelmed by chain restaurants and it’s amazing what you can find once you go outside of the chain arena. I love olive oil dips! I must consume about a liter every 2 weeks. However, some olive oils are to be enjoyed plain and pure in order to fully enjoy its complex array of flavors. Also, I usually propose a few kinds of bread along with olive oil so as to further play with the flavors. I love dipping bread in oil. The herb idea is awesome! Can’t wait to try! I love making knock-off recipes! Your photos are gorgeous. You are very sweet! Thanks so much! I just came across this post and I got so excited when I recognized what you were about to tell us! I worked at Carrabba’s Italian Grill through college and LOVED it! I still rave about it to this day! Unfortunately there aren’t any Carrabbas in NYC (scandalous!! ), but I try to go as often as I possibly can! One part of working at carrabbas was that we had to commit to memory each ingredient in each and every dish, including this herb mix. I hope you won’t be offended, but you are missing 2 small ingredients… There are actually 2 different kinds of garlic used, both fresh minced garlic and garlic powder. There is also parsley. 1/4 tsp. of both. This won’t make a huge difference in the recipe, but for those garlic lovers (like myself) you can never add too much garlic! Thanks for getting the word out about how great this stuff is! I get so torn between great olive oil dips and cold butter on bread. Maybe both! I love the pictures for this post. Is that bread homemade or bought? It makes me drool every time I look at it- I definitely want it when I make this! Thanks so much for your kind words! I wish I could say that the bread was homemade, but I’d totally be lying. It’s from our local bakery and was absolutely delicious! Holy cow!!! I am so glad I randomly clicked on this! I LOVE Carrabbas dipping oil so I can’t wait to try this. It looks so wonderful. I need some bread. Like right now! I made this the other night and it was a huge hit! Thanks for sharing! The bread was actually purchased from a local bakery – I wish I could recreate it though! This was awesome, although it way too salty for my family. Next time I will omit the salt and add a dash of balsamic vinegar. Will def do again!!!!! Is the garlic supposed to be minced or crushed? The list of ingredients calls for minced, but the recipe says to add crushed garlic to the herbs. What do I do? I found this recipe through pinterest and am thrilled to have it! (you have no idea!) My husband and I would do the exact same thing at the chain restaurant here and to be able to make it at home will save us so much time and money – not to mention I always preferred my own meal to theirs. We were just missing this little jewel! Thank you Jamie! I am so happy to hear you enjoyed the dip! Thanks so much for stopping by and leaving your feedback on the recipe. Have a great day. Oh My Lord I could kiss your face!!! This is the best thing that was EVER invented! Thank you so much! I am so happy to hear you enjoyed the recipe. Thanks so much for stopping by and leaving your feedback – have a great day! Your pictures are lovely, would love for you to share your pictures with us at foodepix.com. I can’t wait to try your olive oil and herb recipe; I love the Carrabba’s version! I came over from Pinterest to get the details. My website, pin4ever, lets pinners save a copy of all their pins, boards, and likes. Anybody can get a free backup right now, I hope you’ll check it out! Thanks! Thank you very much for this recipe. I just bought this olive oil in the market. Now I’ll know how to make it by myself. Thanks for the recipe ! My oven is out of commission for a few days until, I can get the heating element replaced. I am cooking Alfredo and Chicken.today. I wanted a dip for fresh bread. Normly when I bake bread we use a honey butter dip, that I feel is better suited for hot bread. I have experienced this dip in restuarants with room temperture bread, so I googled the receipe and found yours. This recipe is so delicious. It was a little to much oil for the amount of herbs, but I just added some more herbs. I also had to used pre-minced garlic from a jar, but I smashed it into the herbs and it released a very great flavor and aroma. Thank you for sharing! Thanks for stopping in to share your experience with the recipe! Have a wonderful day and thank you for following MBA! Oh my goodness; just found this recipe, just tried it, awesomeness. We used fresh basil, garlic, and rosemary. Love it!!! I made this dip tonight and it is indeed just like the fabulous stuff at Carrabbas, Well done! I think the secret is the Rosemary and the kosher salt. Hi, I know this has nothing to do with the dipping oil but… I had dipping oil at an Italian restaurant and in the center they had a black section the size of a quarter. It was really tangy and it went really well with the olive oil for dipping. The color was really dark and i thought it was ink of some kind. I have been trying to figure out what this was for the longest time. Could you possibly know what this was? My guess would be that it was balsamic vinegar or a balsamic vinegar reduction. I’ve seen both of these used in oil dipping sauces – the flavor is definitely tangy, but so delicious. I hope this helps! May I also suggest getting a ceramic grater plate! When you grate garlic it comes out purée like and mixes really well!! Can also use it for nutmeg, hard cheeses and chocolate! I love mine!! the silicone tube will also peel the garlic when rolled!! Thanks so much for stopping by with your grater tips. dip. I actually asked if I could buy the herb mix. cant wait to try this. thanks. I used what I had on hand, Mary. This can be adapted and tweaked however you want. Enjoy. I’ve never been to Carrabbas but this dipping sauce is AMAZING! I used pita bread instead of regular bread but my stomach and I thank you. Fresh rosemary is soft and easily swallowed.Dry rosemary is not good to swallow.It’s like eating last year’s Christmas tree! Lol ! Greeks make a boiled vinaigrette with dry rosemary for fried fish.You push the rosemary aside to eat the fish. Fresh rosemary is amazing, Helen! Thanks for your feedback! We love Carrabba’s bread and dip too!!!! Thanks so much for stopping by, DeeDee! I appreciate you taking the time to comment. Happy Baking!